CodeTwo Public Folders is a Microsoft Outlook extension designed to share Outlook calendars, contacts, tasks, mail and even docs with other users in the company or home network. Use CodeTwo Public Folders to share your Outlook data with others in real-time, manage access rights, work in the offline mode - exactly the same way as with Exchange Server. You can install and start using this software within a few minutes. 64-bit version out now! ...... It's a perfect tool for managers! 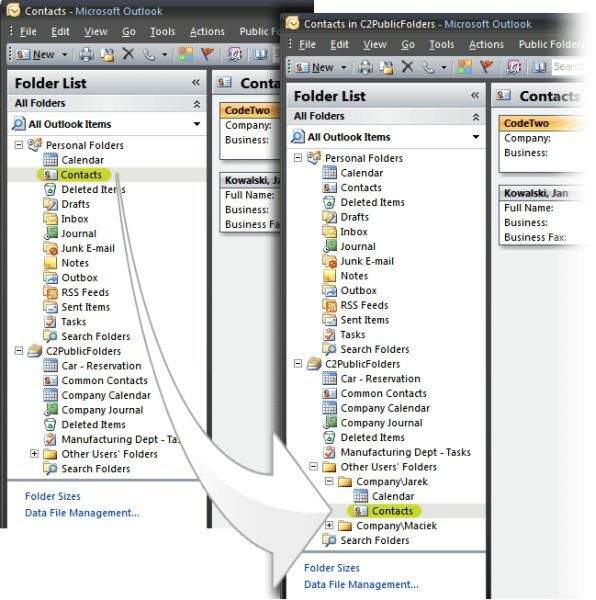 CodeTwo Public Folders synchronizes data between multiple Outlook clients in a local network. The synchronization is performed in the background, automatically and in real-time. - work with shared folders in offline mode - it mimics Exchange Server! Qweas is providing links to CodeTwo Public Folders 4.7.0 as a courtesy, and makes no representations regarding CodeTwo Public Folders or any other applications or any information related thereto. Any questions, complaints or claims regarding this application CodeTwo Public Folders 4.7.0 must be directed to the appropriate software vendor. You may click the publisher link of CodeTwo Public Folders on the top of this page to get more details about the vendor.